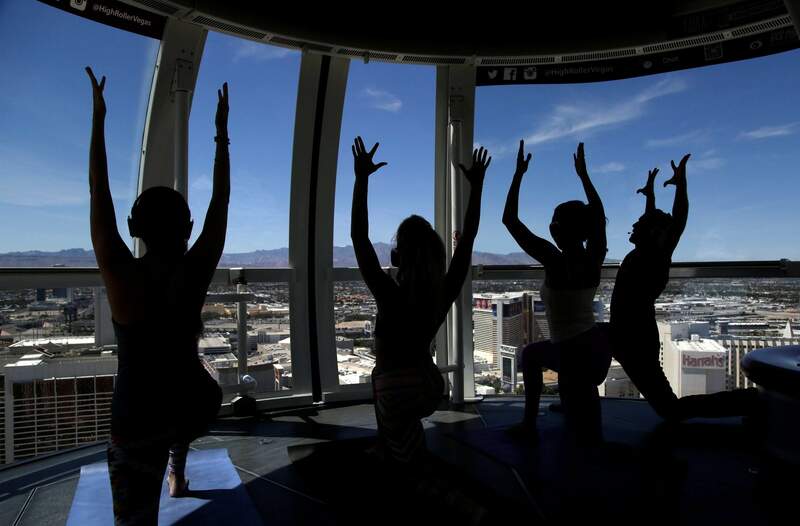 People take part in a yoga class at the High Roller observation wheel in Las Vegas. As Las Vegas continues to broaden the range of interests and wallets it appeals to, companies have been carefully selecting unique, picture-perfect sites where visitors and locals can practice yoga. It wasn’t the price or the points or the location that most influenced Ruth Furman to book a stay at the Holiday Inn Express Waikiki in Honolulu last summer. It was the yoga. Namely, the free poolside yoga every weekday morning. Furman, who makes fitness a priority at home, knew the yoga offering would increase the odds of working out during vacation, as well. It worked. “Since it was so convenient, it was a sure thing.” she says. Plus, she liked how the low-key classes allowed her to work out at her own level. Rather than returning regretful, she was able to take pride in consistently working out. Not every Holiday Inn Express offers free daily yoga. Perks at individual hotels in the Intercontinental Hotel Group – which counts Holiday Inn Express among its brands – differ by property, and that’s true with most of the major chains. But with a little searching, travelers across the country can find a hotel that offers more than a cramped gym to help them stay on top of their workout routine – whether it’s through yoga classes, connecting them with personal trainers or actually leading them on runs around town. That’s because today, the personalized fitness trend is gaining strength in a wide range of hotels, says Deanna Ting, who is senior hospitality editor for Skift, a website that covers the business of travel through news and research. Access to workouts, trainersThe Kimpton Hotels chain puts yoga mats in all of its rooms so travelers can comfortably plank in their downtime. Some even offer yoga and other fitness classes on site. Kimpton La Peer in West Hollywood, for example, partners with local fitness and adventure travel brand Gentry Jackson to provide guests access to personal trainers who can come to the hotel for individual sessions in fitness as well as self-defense. (Individual sessions start at $175; group sessions cost $50.) Guests can also download a custom app created in partnership with Yoga Wake Up to lead them through routines that can be done in bed. Vanessa Martin, founder and CEO of SIN Workouts, which also has non-traveling clients in New York and Miami, says she started targeting the hotel industry a few years ago, when she noticed that hotel gyms were often empty. “It was blowing my mind, recognizing that these properties are building out fitness centers in these beautiful hotels, but nobody’s taking advantage of them and nobody’s really using them because there’s no energy there,” she says. SIN also offers a “fitness concierge” service to book classes for guests at a nearby studio, such as Barry’s Bootcamp, Pure Yoga, SoulCycle or whatever is the best fit for their workout preferences. (The concierge cost is $75 for the service, plus the price of a class.) Martin adds that her team will even go so far as to arrange transportation to and from the class for the client. In-house trainersOther hotels have gone a step further and hired in-house personal trainers. At Kimpton Glover Park Hotel in Northwest Washington, guests can work out in the gym with resident fitness expert Graham King, founder of Urban Athletic Club training facilities, and his team of personal trainers. Their signature offering is the “Urban Athlete Class,” which combines strength, cardio and core exercises; there are also classes for kettlebell training, conditioning and more (group classes cost $30, and guests receive a $10 voucher), as well as personal training sessions, which start at $95 for a 40-minute session. King is also available to design workouts for breaks during meetings. JW Marriott Chicago has a “Fit Squad” team of 10 elite trainers led by Jason Raynor, a strength and performance coach and Nike “Master Trainer.” The trainers lead classes in kickboxing, yoga, functional strength and conditioning, ropes and bells, body weight strength and conditioning, boxing, HIIT IT (which combines boxing with high intensity interval training) and something called “joga,” described as “yoga for athletes.” The team can also tailor private training sessions to guests. Classes are $10 for hotel guests and $20 for non-guests; private sessions start at $125 per hour. At the Swissotel Chicago, travelers don’t even need to leave their accommodations to get their burn on. The hotel recently unveiled its “Vitality Suite,” a 1,700-square-foot, five-room suite with gym equipment, a Peloton bike and a rowing machine. The television is loaded with workouts to follow. Private training (starting at $60 for 30 minutes) is also available either in the suite or at the hotel’s fitness center, where group classes, including yoga, boot camp and other classes are complimentary Tuesday, Wednesday and Thursday evenings. Westin Hotels also has ramped up its fitness offerings. At select locations, guests can take an instructor-led spin class on a Peloton bike in the on-site fitness studio, or hop on a Peloton in their own room. If they’ve forgotten their workout clothes, the hotel has them covered: Guests can borrow New Balance shoes and clothing for $5. But perhaps the most ambitious offering is Westin’s “run concierge” program, which can result in some serious calorie burning while doubling as a cardiotourism adventure. The run guides all have different roles at Westin properties. There are general managers, executive chefs, bellmen, heads of sales. All of them volunteer to be part of the program, showing guests around town while working out at no charge. “We just want to do all we possibly can to help the traveler maintain their routine on the road,” says Heuisler, who is also a running coach and a marathoner. “And as it pertains to running, it can be pretty daunting to run in a new city. You don’t want to get lost. You don’t know where to go. You don’t really know your surroundings.” Running concierges can help alleviate that concern, help mix up the routine and offer travelers experiences they’ll remember.